Pixel Scroll 1/4/18 By Klono’s Scintillating Scrolls And Prismatic Pixels! (1) SPACED OUT LIBRARY. The Toronto Star remembers how it all began — “Sci-fi author Judith Merril and the very real story of Toronto’s Spaced Out Library”. She lived in Rochdale for a year. One year later, in 1970, she would donate the Spaced Out Library and its 5,000 items to the Toronto Public Library…. Some may say atheism does indeed give hope, but it’s a hope constrained within scientism and empiricism – better explained, a hope placed solely in what humanity can control. As Pope Benedict XVI in his encyclical Saved by Hope argued, despite failure, a sense of purposiveness, and suffering, the power of hope in God sustains us. Luke Skywalker’s initial hopelessness and the subsequent revival of the power of hope give us the strongest indication that atheism’s triumph is society’s downfall. a smart, intelligently curated yet ever so slightly soulless example of machine-honed franchise film-making. It ticked every box for fans of the venerable space saga, without ever really pushing the envelope; a movie that eventually made the Kessel Run, but 40 years or so after Han Solo and Chewie had already achieved that legendary feat. — he gives thought to what movies will push the SF envelope in the coming year. The suggestions, with justification and some trailers, are Alex Garland’s “heart of darkness” Annihilation in February, Steven Spielberg’s virtual reality Ready Player One in March, Josh Boone’s superhero The New Mutants in April, Rupert Wyatt’s post-alien invasion Captive State in August, Christian Rivers’ steampunk Mortal Engines in December, and Duncan Jones’ “Moon” successor Mute sometime in 2018. — “Future shock: unearthing the most cutting-edge sci-fi movies of 2018”. (5) WHICH HE DIDN’T ACTUALLY WRITE. Smithsonian.com reminds us about “Thomas Edison’s Forgotten Sci-Fi Novel”. When Thomas Edison died in 1931, he held more than 1,000 patents in the United States alone. He was credited with inventing, or significantly advancing, electric lighting, storage batteries, the motion picture camera, the phonograph and even cement making—among many other things. Edison nearly added another item to his résumé that’s all but forgotten today: Progress, a science-fiction novel he began working on around 1890. Although the inventor abandoned the project before it could be finished, he wrote pages and pages of notes that a collaborator, George Parsons Lathrop, would eventually turn into a work of futuristic fiction, In the Deep of Time, published in 1896. (6) UNLIKE PREVIOUS TREKS. Variety profiles DS9 — “‘Star Trek: Deep Space Nine’ at 25: Through the Wormhole With the Cast and Creators”. “DS9” allowed “Trek” writers the chance to delve into that conflict like never before. Over the course of its run, the show tackled complex subject matter including the ethics of war, faith, cultural identity and the often subtle distinction between a freedom fighter and a terrorist in dark and surprising ways that the previous two series had not. 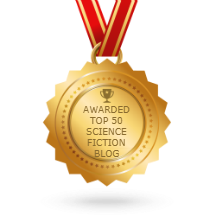 Here are 166 short fiction writers reviewed by Rocket Stack Rank who are eligible for the 2018 Campbell Award. They were selected from the 746 stories reviewed by RSR in 2017 as well as the 821 stories reviewed in 2016. There are many more new writers than the ones in this list, but their stories weren’t reviewed by RSR so they’re not included here. As ever, it only includes writers whose stories appeared in the magazines and anthologies that we reviewed, and the eligibility dates were calculated using isfdb.org. We welcome and appreciate any error reports! I’m posting a series of short story reviews on Black Gate. Each day (well, most days, some days I can’t find anyone who fits the requirements), I’ll be posting a review of a short story by an author whose birthday it is. He began New Year’s Day with “Birthday Reviews: E.M. Forster’s ‘The Machine Stops’”. (10) WEIR SEARCH. The Arthur C. Clarke Center for Human Imagination podcast Into The Impossible continues with Episode 13: Life on the Moon. It’s the end of 2017, but we’ll spend this episode living, imaginatively, in the 2080s, on the first lunar city, called Artemis. Artemis is the invention of Andy Weir, the author of The Martian and another of the great science fiction writers to have come through UC San Diego. We welcomed him back to campus earlier this month, and we have the live conversation to share with you today. (11) RAW SCIENCE. And the Arthur C. Clarke Center for Human Imagination is a partner of the 4th annual Raw Science Film Festival, to be held this year in Santa Barbara, CA, on January 6 and 7th, 2018. The festival honors the best media centered on science and technology from around the world. The mission of the festival is to celebrate science media and ensure fact-based experts stay at the forefront of popular culture. This “Bridge between Science and Media” will honor luminaries and celebrities in science, technology, media, and entertainment and showcase best-in-class films. The culmination of the three day event is a black-tie red carpet awards ceremony on Saturday, January 6 at the Lobero Theater in Santa Barbara, CA. The 100th birthday of Sir Arthur C. Clarke will be celebrated with inspiring experts on interstellar travel, human longevity, scalable healthcare, the ethics of space travel, and lunar colonization! Recent Nobel Prize winner Kip Thorne will roll down the red carpet via Beam robot to present the annual Kip Thorne Gravity Award. The three day event also includes a VIP reception, film screenings, exhibitions, lab tours, and sci-comm workshops. The festival brings science fiction to life and to work in an inspiring weekend of fun, entertainment, and public service. (12) INDUSTRY BIAS. In a BBC interview, “Rosamund Pike says actors won’t ‘play second fiddle’ to actresses”. Pike continued: “Many, many actors are coming out saying we want more female-driven stories, we want fantastic roles for women… so the next consequence is, if you want those to come, then the boys have to play second fiddle. “That’s just the way it is. Until that happens, there will be fewer films with female leads made,” she added. Films with leading female stars and supporting male actors are not as common as the other way round. But there are some well-known examples, including 2013’s Oscar-winning film Gravity, with Sandra Bullock playing the lead alongside George Clooney, and sci-fi flick Arrival (2016), with Jeremy Renner in a supporting role alongside Amy Adams. Note that the two exceptions cited are both genre. (13) ACROSS THE STRAITS. NPR reports In “Alaskan infant’s DNA tells story of ‘first Americans'”. Genetic analysis of the child, allied to other data, indicates she belonged to a previously unknown, ancient group. Scientists say what they have learnt from her DNA strongly supports the idea that a single wave of migrants moved into the continent from Siberia just over 20,000 years ago. NPR observes that the excavation was done with the cooperation of Native American groups — “Ancient Human Remains Document Migration From Asia To America”. Potter says during this great migration, either before or after they crossed the land bridge, this group (which the researchers call the founding population for all Native Americans) split again, into two populations. Scientists had suspected this and surmised that one group stayed put in and around Beringia. They call them Ancient Beringians. The two infants are the first hard evidence that they did indeed do that. The other group moved down into North and South America and are believed to be the direct ancestors of current Native Americans. (14) APPLY FOR CLARION. Applications are now open for the 2018 Clarion Science Fiction and Fantasy Writers’ Workshop! Eighteen students will be selected to spend six weeks at UC San Diego, writing, studying, and workshopping with leading writers from the field. The deadline to apply is March 1. The 2018 writers in residence: will be Christopher Barzak, Holly Black, Mat Johnson, Kij Johnson, Kelly Link, and Gavin Grant. Equating a raccoon’s family’s misfortune to a real-life human scenario that begins with unemployment and escalates to homelessness, lack of funds for medicine, and a child having to drop out of school to help support the family seems inappropriate, despite their admission that they love living in a garbage can. We don’t want to give the misperception that we are making light of or trying to derive humor from a tragic, human situation. (17) BEWARE FALLING GODS. Here’s The New Legends of Monkey: Extended Trailer. Inspired by the 16th Century Chinese fable Journey to the West, ABC ME’s The Legend of Monkey is 10-part half-hour series that follows a teenage girl and a trio of fallen gods on a perilous journey to bring an end to a demonic reign of chaos and restore balance to their world. Coming to ABC ME January 28.